Is this safe for a pregnant dog? It has not been established during pregnancy and lactation. Please consult your vet for advice on suitable treatment. This also kills ear mites? Is it safe to alternate between this med and heartgard since I don’t need to treat my dogs every month for all the parasites this treats kills, - but do need to do heart worm prevention monthly ... ? Yes Advantage Multi / Advocate also kills the ear mites. 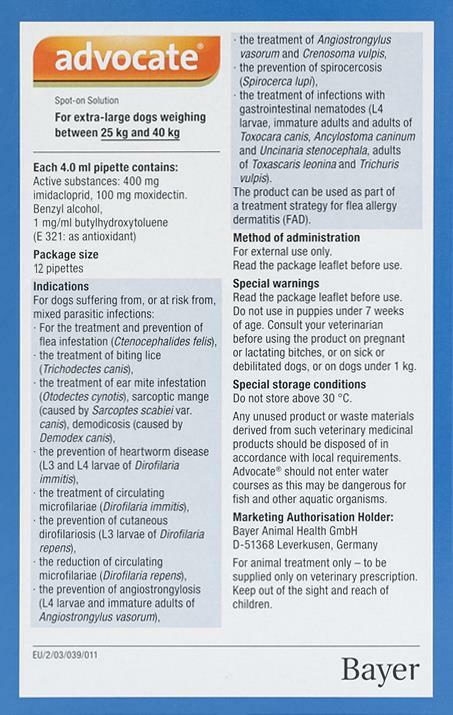 The ingredients in this product and Heartgard are different so it is safe to use alternately and in theory it should work, however we strongly recommend you get advice from your vet about heartworm protection. This product is a preventative. If your dog already has heartworm you must get advise from your vet. Do they have to have heartworm test before they can use. This product is used for prevention. It's a good idea to get your dog tested If you suspect he/she might have heartworms. Our newest rescue dog tested positive for heartworms. Bad news. After considering different treatments we decided on the Moxi/Doxy protocol using Doxycycline and Moxidectin. Advocate (Advantage Multi) has been proven to have a higher rate of effectiveness than ivermectin. Easy to apply and works great!